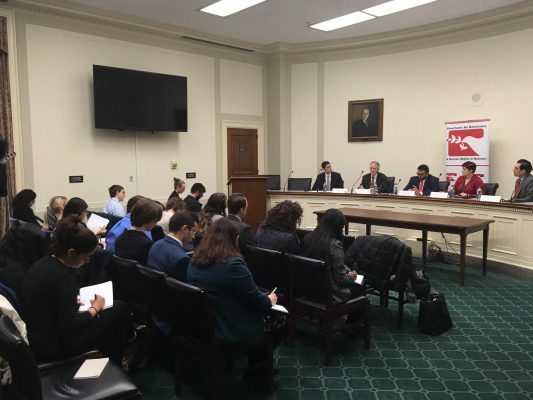 12 February 2019 – Today, Americans for Democracy & Human Rights in Bahrain (ADHRB) held a Congressional briefing on the current state of human rights in Bahrain, entitled “Promoting a Human Rights-centric Approach to US Policies Towards Bahrain.” Husain Abdulla, ADHRB’s Executive Director, moderated the panel, and was joined by Joe Stork, Chairman of the Gulf Centre for Human Rights’ Advisory Board and former Deputy Director of Middle East and North Africa at Human Rights Watch; Philippe Nassif, Advocacy Director for Amnesty USA; Bridget Quitter, ADHRB’s Legal Officer; and Michael DeDora, the Committee to Protect Journalists’ (CPJ) Washington Advocacy Manager. The event focused on the human rights situation in Bahrain eight years after the government violently suppressed the mass peaceful pro-democracy movement that began on 14 February 2011. 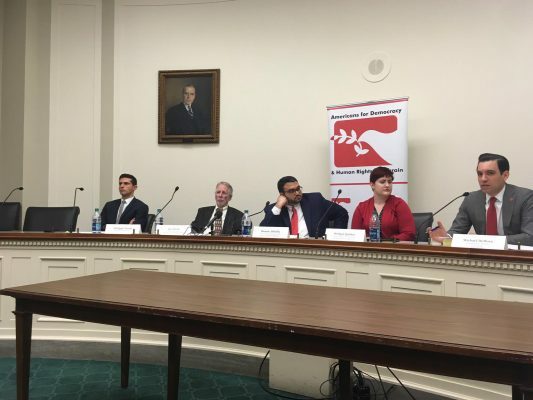 It highlighted approaches the United States government can take to effectively hold the Bahraini government accountable for its rights abuses even as the current US administration has prioritized security in foreign policy over fundamental political, social, and economic rights in Bahrain. 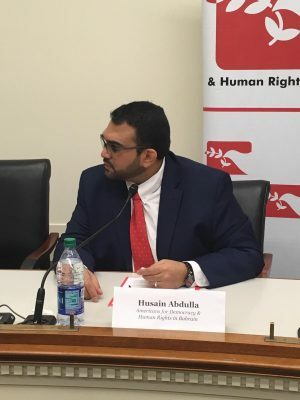 Husain Abdulla opened the panel by providing a brief overview of the Trump administration’s current stance on Bahrain’s human rights abuses. He remarked that as we approach the eighth anniversary of the 2011 protests, it has become apparent that the human rights situation in Bahrain has deteriorated sharply. The government has closed off independent civil society engagement, suppressed religious freedom, targeted human rights defenders, and moved to restrict free expression. This approach has been buttressed by President Trump’s remarks during a visit to Riyadh, where he stated that “there will no longer be strain” in the relationship between the US and Bahrain. Soon after these comments, the Bahraini government attacked a peaceful protest in Diraz, killing five people. Despite this, the US has not taken serious steps to hold the Bahraini government accountable. Joe Stork highlighted the major events leading up to and surrounding the 2011 protests, citing the drastically different path that Bahrain appeared to be on in the early 2000s when opposition parties and reformists pushed for a constitutional monarchy. Despite this, Bahrain has evolved into a distinctly authoritarian government, although many Bahrainis felt that, with the other Arab Spring protests and with reformers within the government, their protests in 2011 would serve as a turning point. Rather, Stork noted how, on the night of the protests, Bahraini security forces violently dispersed peaceful demonstrators using live ammunition and tear gas. As more citizens joined the demonstrations, the government embarked on a major campaign to suppress the popular uprising. Authorities arrested thousands in pre-raid operations and used lethal force, killing over forty citizens, half of whom died in police custody. In the wake of the violence, the government attempted to justify its use of force by claiming it needed to curtail supposed Iranian influence, a claim that has been disputed by human rights organizations. Turning to the current state affairs in Bahrain, Stork noted that the recommendations issued by the Bahrain Independent Commission of Inquiry (BICI) meant to improve the situation and ease tensions have been largely ignored by the government. While the government implemented two recommendations – curtailing the power of the National Security Agency and ending the military courts’ ability to try civilians – it later reversed that progress, re-empowering both institutions. Other recommendations have been implemented only nominally. On the contrary, the government has moved to dissolve political opposition groups, close independent media, and jail human rights activists, while the bodies that have been responsible for human rights abuses and violations have escaped judicial review and accountability. 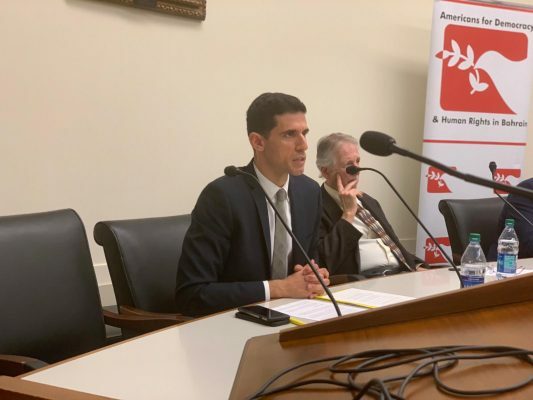 Stork also noted significant trends in denaturalization, highlighting that since 2011, the government has revoked the citizenship of over 750 Bahrainis, rendering them stateless. This policy has been paired with a concerted effort to grant citizenship to non-citizen Sunnis – an effort that seeks to alter Bahrain’s demographics. This is additionally significant because non-citizen Sunnis comprise a large percentage of the security force which polices the country’s majority Shia citizen population. Stork concluded his remarks with recommendations that members of Congress request an official visit with political prisoners in an effort to bring international attention to their cases, and to also lobby the government to give independent organizations access into the country to conduct an analysis on human rights within the country. 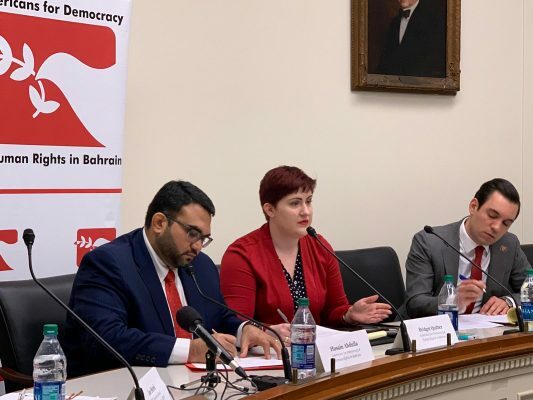 Bridget Quitter provided context for Bahrain’s lack of accountability for its abuses noting that despite Bahrain’s rampant human rights violations, countries like the US continue to sell weapons to Bahrain while deciding not to raise human right concerns. Quitter noted that a mechanism exists to promote great accountability for rights abuses, although it is underutilized. She referred to the 2016 Global Magnitsky Human Rights Accountability Act, which was designed to hold gross human right violators and states responsible for significant corruption and abuses accountable through the use of sanctions. In 2017, the Trump Administration further expanded the power of the Global Magnitsky Act through Executive Order 13818 thereby allowing serious human rights abuses to be considered regardless of the status of victims. Previously the law only protected whistleblowers and human rights defenders. The Executive Order also allowed for perpetrators to be held accountable on the principle of command responsibility. In its initial iteration, the Act stated that only those with direct responsibility could be subjected to sanctions. With this revision, the Act allows the US to better combat corrupt and abusive governments. Despite the existence of such an effective legal mechanism, the Act has not been used in the case of Bahrain. Quitter noted how even with the murder of journalist Jamal Khashoggi by the Saudi government, the Trump administration has been resistant to enforce the Act due to the US’s extensive security cooperation with the Saudis and by extension, the Bahrainis. Quitter suggested that applying the Global Magnitsky Act to Bahrain may be able to bring real, measurable change. However, Quitter emphasized that this could only be possible if the US prioritizes accountability towards its allies accountable rather than just countries that do not align with its goals. DeDora further highlighted various cases in which the Bahraini government suppressed the right of free speech. He called attention to the Bahraini government’s temporary closure in April 2011 of Al-Wasat, Bahrain’s only independent newspaper. The following day, the newspaper’s co-founder Karim Fakhrawi, was arrested while complaining to authorities that the government was trying to bulldoze his house. Seven days later, Fakhrawi died in Bahraini custody. More recently, on 8 June 2017, Bahrain’s Interior Ministry announced that posting anything sympathetic to Qatar is punishable by a lengthy prison sentence, more explicitly tying national security concerns to free expression. Calling attention to the restrictions on free expression, DeDora highlighted the great personal risk that Bahraini journalists face for challenging the government and its policies, including heightened risks of harassment, intimidation, torture, imprisonment, and death. Turning towards policy prescriptions, DeDora discussed the necessity of a shift in US policy towards a thorough re-assessment of its approach to foreign policy and human rights abuses. 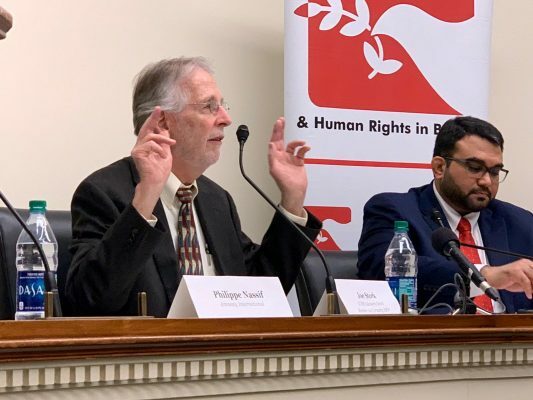 He asserted that Members of Congress should be more engaged in using U.S. foreign policy as leverage to influence human rights efforts in Bahrain. Furthermore, lawmakers can directly engage by adopting prisoners’ cases, writing letters to prisoners or their families in solidarity, asking to visit high-profile political prisoners in jail when visiting Bahrain or other Gulf countries, utilizing social media to bring awareness about specific cases, and writing op-eds. DeDora maintained that lawmakers can sponsor congressional briefings with NGOs advocating for human rights defenders, regularly submit prisoner’s cases to the state department, continuously push for legislation to place sanctions on those guilty of human rights violations, and ask foreign embassies about information regarding prisoners to prompt change. Philippe Nassif alluded to DeDora’s focus on the dangers of reporting in the Gulf countries. Amnesty International lacks on-the-ground access in Bahrain, creating difficulties in gathering information directly from Bahrain. In official capacity, Amnesty has been unable to visit Bahrain in many years. However, Amnesty continues to obtain information in meetings with other countries with exiled individuals as well as through external monitoring. In regards to measurable steps to address the situation on the ground, Nassif encouraged the call for a lift on the ban on peaceful protests and for organizations to encourage partner states to Bahrain to end the transfer of equipment that can be used for oppression. Nassif further asserted that the intervention in Yemen led by Saudi Arabia is often justified as a protection against Iran – a narrative which governments in the Arab Gulf have used to justify rights abuses. As the Yemen war continues, the US has refused to hold rights violators accountable and instead continues to arm states like Bahrain and Saudi Arabia. 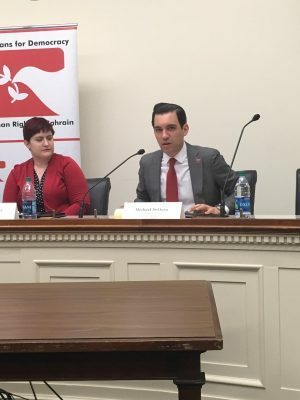 In light of this, Nassif recommended that organizations and the current US administration take a close look at legislation specifically focused on Bahrain. Nassif explained that the US holds significant leverage in the Arab Gulf region. He used the cease-fire agreement in Yemen as an example, stating that when it appeared that Congress would pass legislation to end US involvement in the war, the parties to the Yemen conflict worked to craft a cease-fire. 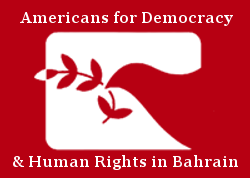 By calling the government out on its violations, exerting pressure on behalf of the current US administration, cutting off support for these countries to continue with their human rights abuses, and refining foreign policy directly related to Bahrain, the US can play a fundamental role in the promoting human rights in Bahrain.